“He wouldn’t be welcomed back here again!” 11 months ago I was reconnecting with an SVP at one of the “Big 3” in enterprise SW (I’ll call him “Mike”) and that’s what Mike had to say about a common connection (I’ll call him “Rick”) that he worked with for several years. Apparently, after Rick’s startup had been acquired, he demanded numerous changes to the organizational structure and project prioritization to suit his interests. Then, having delivered no meaningful results he left for another startup, and then another. But only 2 years (and 2 startups) later, Rick landed right back at the same “Big 3” company, again in a VP role. As shocking as this can be, it’s very common to see high tech executives with spotty records land on their feet. “Where’s the justice? !”, you might ask. Well, what Rick lacked in substance, he more than made up in political savvy and he played “The Game” quite well. As you rise the ranks in corporate high tech, relationship skills become even more important than functional competency. Last week, I was discussing this idea with Paul Burrin, a VP at Citrix Online, and he summed it up this way “I’ve worked in environments where executives with strong relationships could get by with being moderately competent in terms of their functional knowledge and results.” In other words, you’ll surely get fired for incompetence, but it’s your high EQ aka Emotional Quotient (i.e. self-awareness, empathy, and dealing sensitively with other people) that will enable you to effectively climb the corporate ladder and stay in the upper echelon. These “relationships” can take on different forms, spanning from strong relationships built on mutual trust and respect to self-interested, destructive cronyism where individuals put their own needs ahead of the company’s. Every time the word “politics” is mentioned at one of our corporate workshops or public events, there’s noticeable discomfort in the room. Business is about making money and businesses thrive when smart people struggle to figure out the best way to handle the toughest problems. Corporate politics inevitably play a role in these situations, but there’s no reason that “politics” have to be inherently negative, as many people tend to perceive them. Find a new department or company that more closely shares their values. Having a strong EQ will equip you to deal with and flourish in good and bad politics. Check out what Jeff Russakow, former EVP at Yahoo!, had to say about the importance of EQ. Here are some ways that you can build up your people and organizational relationship skills. Embrace Line-Of-Business (LOB) Tensions – when you’re under pressure to get things done, the last thing you want is someone from another part of the business putting road blocks in your way and slowing you down. Instead of getting frustrated and wasting your energy in disagreements and conflict, consider the LOB perspective that person has. LOB tensions are like “checks and balances” for businesses. If everyone is always agreeable, you might be missing something very important. Reframe your “asks” – It’s much easier to get people to do something for you if there’s a benefit for them. If you are a marketer and trying to roll out a new program or campaign for Sales, tell them how it’s going to help them with bookings, revenue and attaining their quota and NOT about how it’s going to increase market share, demonstrate thought leadership, or improve the inner mechanics of Marketing like web lead conversions, etc. Focus on Respect, not being Right – In heat of battle, driving your business and beating your competition, consider the longer term implications of how you “throw your weight around.” I was speaking with Moshe Gavrielov, CEO of Xilinx, and he said “As a CEO, it’s more important to focus on respect rather than being right.” His point is that the most successful executives understand how important establishing and maintaining good relationships are for effective leadership. Keep your Friends Close and Your Enemies Closer – Good and bad politics intensify significantly the higher up you go in the organization. You can’t avoid conflict nor the people who may be creating problems for you. It’s worse to be blindsided by them, so find ways to meet with them on a regular basis. Instead of being surprised, you’ll be prepared. Then you are in a better position to proactively manage the situation, minimize damage to your team, and get the focus back on moving the business forward (rather than personal agendas). Forging strong interpersonal and cross organization relationships is critical for any leader. Your functional, domain expertise is likely what got you where you are today BUT it’s not what will get you to the next level and keep you there. 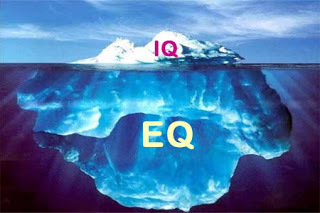 Do yourself a favor and evaluate your EQ compared to your IQ. What have you done to build up your EQ and cross organizational relationships? Please share your experience. If you found this interesting, please use the toolbar below to share it with your network.